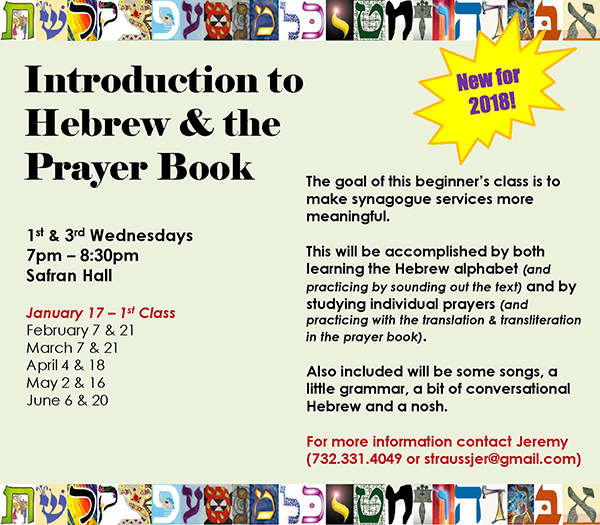 Beginners Hebrew Class: Intro to Hebrew and the Prayer Book. This class will meet the first and third Wednesday of each month, 7:00-8:30 p.m, beginning January 17, 2018. Learn the alphabet and practice sounding out the Hebrew. Learn the meaning and purpose of individual prayers. – all at a gentle pace. For more information contact Jeremy Strauss at 732 331-4049 or email him at straussjer@gmail.com.